While the PC isn’t disappearing anytime soon, it may as well be the deranged grandmother locked away within Intel’s attic, whose faint screams are ignored in the rooms below. Indeed, Intel’s newly minted chief executive, Brian Krzanich, speaking to analysts and investors in his Q2 2013 earnings call, didn’t even mention notebooks, let alone the desktop, in his prepared remarks. And the only mention he made of the personal computer was a mea culpa: “We were slow to respond to the ultramobile PC trend,” he said, admitting that part of Intel’s job was to scan for trends and react to them. Intel chief executive Brian Krzanich. Krzanich has an excuse: He’s been on the job for just two months, taking over for Intel’s prior chief executive, Paul Otellini. As analyst Patrick Moorhead of Moor Insights noted, Intel was bailed out once again by its success in the data center market, where revenue was up 6.1 percent sequentially and flat year-over-year in Intel’s second-quarter earnings, which it reported on Wednesday. But sales within the PC Client group plunged 7.5 percent compared to the same period a year ago, representative of the continuing slide in the PC market. Minimizing power, not maximizing performance, is now the point of almost everything Intel does. ”Ultramobile” is now synonymous with PC. Desktops and notebooks exist, but they won’t be the priority. And tablets will make up a small, but increasing portion of Intel’s business, using its Atom processor. Those with the best fabs, win. Intel will ramp its next-generation 14-nm manufacturing technology this fall, a fundamental approach to increasing performance, lowering power consumption, and extending battery life. 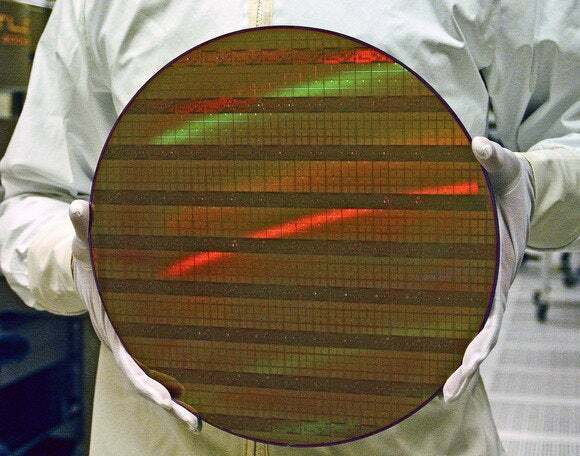 Defect densities with Intel’s current 22-nm process are at record lows. Intel’s Atom processor is now on an equal footing with Intel’s Core chips with the PC. “Atom will be an equal player in technological leadership within the product space,” Krzanich said. Manufacturing will continue to be a key to Intel’s success. ”So Bay Trail really first and foremost we believe gives solid performance, solid battery life relative to the competition in price points and markets that we’re simply not in, in a big way today,” Krzanich said. Intel executives reiterated two key points, over and over: cost, and power. Krzanich didn’t paint Intel’s next-generation Core chip, Haswell, as a tool for healthcare or engineering. 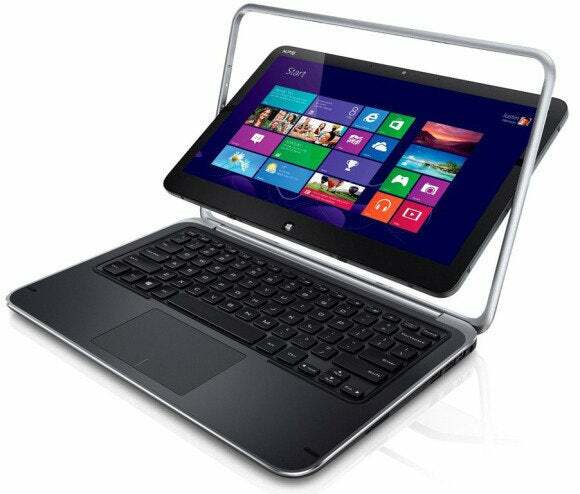 Instead, it will help power what Krzanich said were 50 next-generation “two-in-one” convertible tablet designs. And Samsung will include Intel’s next-generation “Bay Trail” chip and LTE baseband solution inside Samsung’s upcoming Galaxy Tab 3 tablet. Intel chief financial officer Stacy Smith staked out some pretty aggressive price points during Intel’s first-quarter call in April: touch-enabled ultrabooks will sell for $499 and $599 during the holidays, he said, with $300 “Bay Trail” Windows and ARM tablets making up the low end. On Wednesday, Krzanich went even further, stating that clamshells and touch-enabled convertibles could be priced under $400, and even under $300 in some cases. Intel-based tablets should cost about $199, and as low as $150. (Whether those ultra-cheap tablets will be powered by the older Clover Trail tablets or the newer Bay Trail tablets wasn’t clear.) The fact that Intel’s Atom processors can be used both with Windows and Android makes them even more attractive to customers, Krzanich claimed. I’ve wondered before whether Intel’s Atom and Core processors would collide at the low end, and whether or not the company would be able to set up a clear delineation between the two. If Intel can really hit both price points with its two chip families, it appears that won’t be a problem. The underlying message is that Intel believes that is has essentially won the PC market, relegating rival AMD to the values segment within desktops and notebooks. To its credit, however, AMD has captured all of the major consoles, and has shown a willingness to design semicustom chips for key partners. Nevertheless, Intel is far more worried about the threat ARM poses in the tablet and ultraportable market, where cost and power are the key metrics. To date, buyers have been suspicious of heavily discounted tablets and notebooks, precisely because the performance has ranged from disappointing to awful. Intel clearly believes the Atom can change that perception; if it can, Intel will also change the game.